At age 83, Fritz Lang's Metropolis has been given a new lease on life. Not that it needed it, exactly. Lang's immensely influential vision of a dystopic future society had enjoyed a full restoration of its known elements in 2001, playing theatrically to much fanfare. I saw it for this first time that year, on the big screen. I was totally dumbstruck by the movie as a technical and visual achievement, and as a moving, involving story. To that point, I had viewed silent films more or less as interesting curiosities, films that lacked a crucial communicative element; movies from the pre-sound era seemed handicapped or unfinished. Seeing Metropolis for the first time, I realized that silence could be used, even embraced, by filmmakers who had mastered this very specific form of the medium to tell stories in ways that sound films could not and never did again after the release of The Jazz Singer in 1928 - the film that destroyed an art form in the name of technological progress. For me, seeing Metropolis carried the realization that silent films were capable of a very specific kind of storytelling unavailable in any other medium - the highly physical acting, the use of music as a kind of "narrator," the development of camera movement and other photographic techniques - among other stylistic devices, these marked the silent film era as the period in which people taught themselves how to tell stories on film. Since seeing Metropolis a decade ago, I have delved deeper into the silent era and have fallen in love with Pandora's Box, Sunrise, The Kid, and Asphalt, among others, and have learned that the silent era was much like our own - in the sense that most of the films were bad, but they were also capable of being as masterful as anything we might expect from the great filmmakers of any age. Metropolis towers above most of its peers. Famously cut upon its original release (the film was a financial failure), a fully-restored Metropolis was thought to be impossible - and probably is. But a huge step in that direction was made in 2008, when a nearly-complete 16mm dupe negative was discovered in an Argentine film archive. Previously missing footage - amounting to about 25 minutes' worth - was edited back into the already-restored 2001 cut. The reinstatement of this footage rounds off the film's heretofore jagged narrative edges. The whole thing plays significantly better, providing numerous contextual shots, plus a few longer sequences that clarify plot mechanics, and character dynamics. Given that the restored footage comes from a degraded 16mm source, its aspect ratio is slightly altered, and damage to the negative is obvious, despite an intensive year-long restoration process. Lang's narrative takes us to an unnamed future city called Metropolis. Presided over by master architect Joh Frederson, the city is operated by an army of drones who, with their families, live and work deep underground. Above ground, only the privileged and wealthy see sunlight, living lives of frivolity and ignorance. Frederson's son, Freder (ugh! ), begins to wonder about these unseen workers after a beautiful woman named Maria appears above ground one day with a group of workers' children. She is sent away, but the sensitive Freder pursues her and discovers the underground world of the workers and the gigantic machines that they operate. When Frederson discovers his son's newfound empathy for the plight of the exploited workers (what an undergrad! ), he sets in motion a plot to tear the workers' movement apart from the inside. Frederson enlists the mad inventor Rotwang and his proto-robot, the Machine-Man, which he disguises as Maria, who is also the workers' spiritual leader. The Machine-Man, in Maria's guise, foments a violent revolution, which Frederson intends to use as justification to bring the workers more firmly under his thumb. The storyline of Metropolis is philosophically muddled, demonstrating a naïve and incomplete command of the socio-political "machinery" it means to discuss. There is a strange, unexplained reliance on Christian imagery and allegory that doesn't exactly mesh with the film's already otherworldly setting. As a character, Maria is strongly mystical at some moments and incredibly vulnerable at others. Freder comes off as an over-the-top bleeding heart with no real charisma, although he redeems himself through direct action in the picture's final act. But Metropolis's successes massively outweigh these thematic weaknesses. Despite being cast as under-developed characters, Brigitte Helm and Gustav Frohlich shine as Maria/Machine-Man and Freder, respectively. Helm is particularly fascinating when she takes on the part of the Machine-Man-as-Maria, head twitching mechanically in gestures that come off as creepy and surprisingly un-human. The other performers are good, too, including Alfred Abel as the moody, powerful Frederson, and Rudolf Klein-Rogge as Rotwang, the mad inventor. But really this is Lang's show all the way. Metropolis is a powerhouse of Deco-era design, evident in everything from the sets and background paintings, down to the costumes and smaller décor. There's the M-Machine, which Freder envisions as Moloch, a demon that actually consumes workers whole with a mouth filled with fire. There's Frederson's office, a sparsely-furnished model of the Deco era's love of space and flatness. There are the multi-matte shots of Metropolis itself, with Frederson's New Tower of Babel dominating the skyline, replete with elevated highways and a variety of flying vehicles. There is the Machine-Man, that iconic centerpiece of the film's design sense, a sculpted femme-bot with flared forearms and hip joints, and an electro-charged life-giving aura. Lang's command of the film's huge sets - and how to place and move the camera within them to create a sense of space and action - is supreme, particularly in the context of the silent era. Silent films tend to feel physically stiff - Lang's gigantic environments allow actors to move freely, creating more credible settings and situations. Silent films love to place women in peril, of course, and an unopenable door often spells doom. In Metropolis, Maria is chased by Rotwang at one point, and she isn't just prevented from opening a single door, but a whole hallway of them, and when the doors don't open, she finds other means of escape. This pattern continues, with the actors moving through one large set into another, as one means of escape leads to another moment of impending danger - it's an incredibly fluid, tense sequence that utilizes huge resources in the service of masterfully-escalated suspense that is more involving and more realistic than the average chase - then or now. Metropolis is enormously involving from beginning to end, even at its longer restored length of 149 minutes. A gripping plot, a gallery of individuated characters, endless visual delight, and a monumentally ambitious production scale don't just maintain our interest but make us stop to think about the prodigious skill and conceptual balls it took to pull it all off. The restoration leaves the story feeling fuller and better-shaped than any previous cut. Add in a new recording of Gottfried Huppertz's original 1927 score in 5.1 surround, and this Metropolis is easily the biggest cinematic event of 2010. As I already mentioned, the restored footage is not in ideal condition. But it was in much worse shape when it was found. For myself, I stopped noticing the aspect ratio shift and the back-and-forth between the pristinely-restored known footage and the newly-rediscovered footage, which is softer overall and streaked with damage in almost every instance. Although I hope that one day the newfound footage is cleaned up further, I'm very happy to have it as-is, because it serves the story so well. The footage that was restored in 2001 looks outstanding, of course, possibly better than any other silent film I've seen on DVD. The 5.1 surround score by Huppertz is performed by the Rundfunk Symphony Orchestra of Berlin, conducted by Frank Strobel. It's a driving score, and Wagnerian in conception, packed as it is with recurring leitmotifs and references to other music, including La Marseillaise. The sound quality is enveloping and powerful. Given the significance of the film and the mega-event that this restoration represents, I had hoped for a larger array of extra features. I would have loved a couple of commentary tracks and alternate musical scores, and perhaps a feature on Lang and his wife and collaborator, Thea von Harbou. Unfortunately, there's just not much here in the way of extras, although what we do have is quite good. There is a bonus disc here with two main features. First is the excellent Voyage to Metropolis (54:17), a documentary exploring the film's production as well as the recent restoration. We also have an Interview with Paula Felix-Didier of the Museo del Cine in Buenos Aires. She tells the story of the missing footage and how it wound up in the Museo. Finally, there is a 2010 re-release trailer. 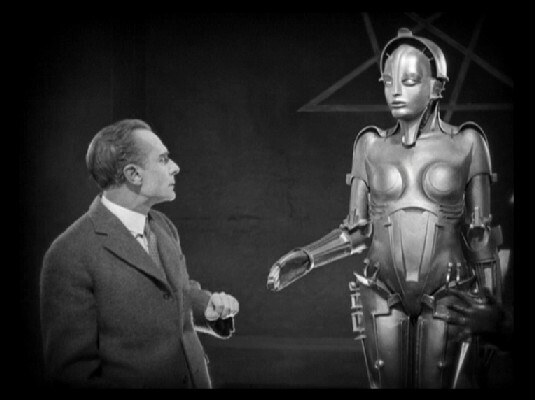 Metropolis is a must-see, must-own title for anyone even marginally interested in the history of cinema. Beyond its historical significance and influence, it remains incredibly entertaining, full of wonderful imagery, good performances, and a commanding score. This recent restoration, while technically imperfect, still manages to achieve the impossible by improving this towering, iconic film. DVD Talk Collectors Series.